Do you have an existing website that needs changes or updates? Need general website updates on a monthly basis? 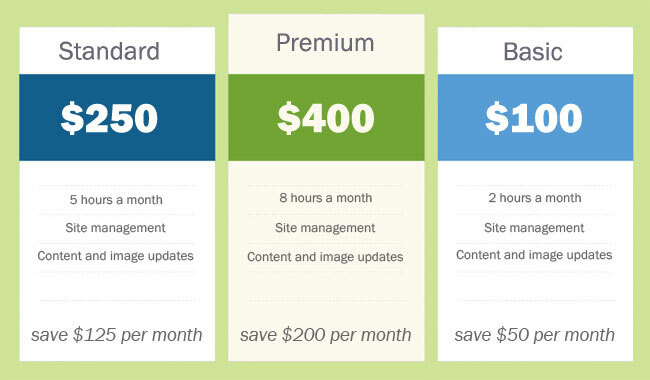 Digital Scribeworks offers monthly website maintenance and pay as you go hourly rates. We offer a 25% discount to non-profit organizations. Cost-effective. You don’t need to hire a web developer or pay for staff training. Quick turnaround. Most request are processed within 24-72 business hours. Professional and detail oriented service. We take care of all the technical stuff, so you don’t have to. Plans are month-to-month and can be upgraded or downgraded as needed. Payment: All payments will be in US dollars. Payment is due prior to work beginning. Payment will be accepted via PayPal. For all maintenance plans, the term of this agreement are month to month, automatically renewable unless cancelled by the Client in writing. Client will be billed for agreed upon hours regardless of actual hours used. Unused hours do not roll over into the next month, or cannot be pulled from future months. No refunds are issued for unused time. You may exceed your plan by up to one plan size before additional billing. Hours over are billed $50/hr at the end of the calendar month. Cancellation: Client may cancel all maintenance plans by email. Unused hours will not be refunded after cancellation but can be used up until end of plan month. Digital Scribeworks reserves the right to terminate this agreement at any time for any reason without any prior knowledge and will do so in writing by email and/or postal letter to the client. We offer flexible pay as you go for website owners that have less-frequent, seasonal or one-time website maintenance request. Most updates are completed within 2 business days and often within the same business day. Larger updates take slightly longer but we do guarantee that the updates will be completed when the time period you are quoted. We offer urgent request for updates/changes that need to be done ASAP or after business hours. Urgent requests are charged at an hourly rate of $100.